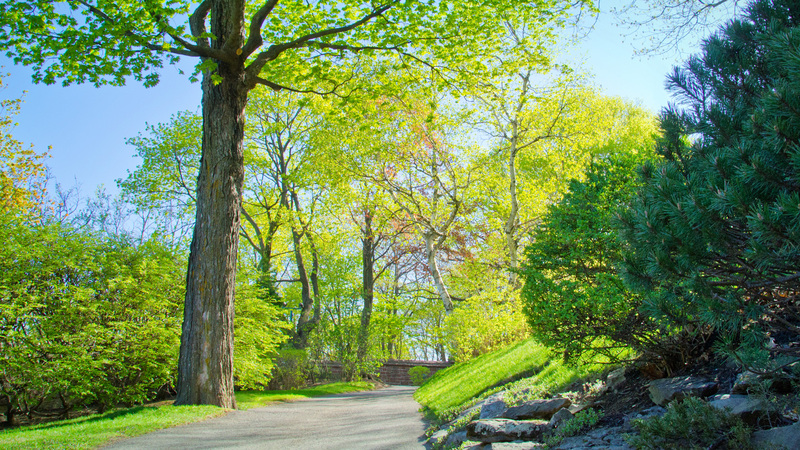 The outdoor Garden of the Way of the Cross is one of Saint Joseph’s Oratory’s best kept secrets. Located on the east side of the Basilica, the garden shelters a magnificent Way of the Cross made of towering sculptures, which unfold amidst an artfully landscaped terrain. It is an exceptional space to meditate in communion with nature. The Garden of the Way of the Cross is open from May 1 to October 14 2019. From the early days of the shrine, a Way of the Cross was marked out on the mountain to allow the faithful to come and meditate upon the Passion of Christ. This devotion was very close to the heart of Saint Brother André. Work on the 200,000 square-foot area to the East of the Basilica did not begin until the Fall of 1942. Famous landscape architect Frederick Todd designed a pathway meandering around the flank of the mountain transforming the site into a magnificent garden with many varieties of trees, shrubs and flowers. This lovely green space showcases one of the most beautiful treasures of Canada’s religious heritage. Montreal artist Louis Parent conceived this major artwork. His Way of the Cross has 14 of the traditional stations to which he added a marble monument depicting the Resurrected Christ and a reflecting pool with the Fountain of Redemption. In total, the grouping comprises 42 characters, each approximately 9 feet high, which the sculptor modeled in his workshop at the Oratory, between 1943 and 1953. The statues were carved out of Indiana limestone by Ercolo Barbieri, between 1952 and 1958. Louis Parent designed the pieces to blend harmoniously into the natural environment. Art critics have had nothing but praise for this work that has stood the test of time. Saint Joseph’s Oratory is part of the Quebec Gardens’ Association.